Multipurpose backrest & luggage rack system! 1660: Introducing the first, truly multipurpose backrest & luggage rack system. 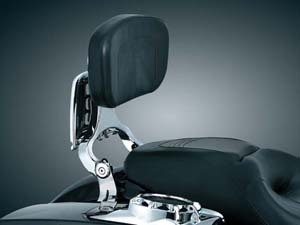 Once installed, no tools are needed for adjustments making the switch from rider to passenger backrest a snap. 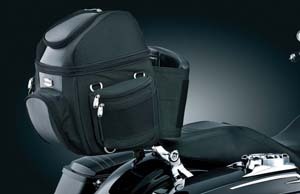 Full adjust-ability will help you enjoy those longer rides & with the incorporated luggage rack, carrying all your stuff just got a whole lot easier. Truly multi-purpose – provides driver or passenger backrest along with a convenient luggage rack that can be used in either position. Sturdy aluminum main frame, steel folding luggage rack with rubber inserts, & comfortably padded backrest. 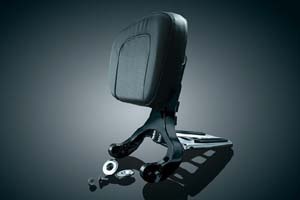 Extremely versatile – backrest converts from driver to passenger without tools in seconds. 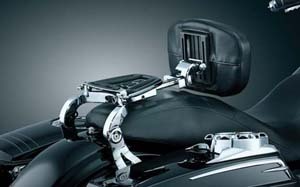 Backrest pad is fully adjustable via stainless sliding rods with push-button locks & knurled threaded knobs. Note: Backrest & Mount Plates sold separately. 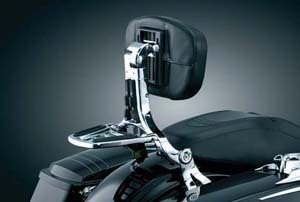 You must order the Back rest #1660 Then order the appropriate Mount kit for your model bike! 1661: Same as 1660 but in black. 1664: Fixed Tall Mounts: For use with touring seats more than 6” thick measured at the front of the passenger seat (pr). 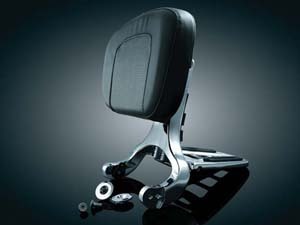 1663: Fixed Low Mounts: For use with low-profile seats 6” thick or less measured at the front of the passenger seat (pr). 1666: Fixed Tall Mounts: For use with touring seats more than 6" thick measured at the front of the passenger seat (pr) Note: Compatible with stock seats on '09-'12 FLHR & '09 FLHT Standard, '11-'12 FLHX, '11-'13 FLTRX. 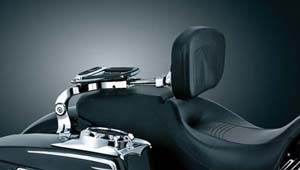 1665: Fixed Low Mounts: For use with low-profile seats 6" thick or less measured at the front of the passenger seat (pr) Note: Compatible with stock seats on '09-'12 FLHX, '09 FLTR, '10 FLTRX, & '09-'13 FLHRC. 1662: Fixed Mounts for '14 Street Glides & Road Kings.